The South Shore R/C Flying Club fun fly is an annual event held in the Lunenburg area of Nova Scotia, between Mahone Bay and Bridgewater. See photos below. The club operates a private airfield in partnership with R/C Wings Hobby Supplies (see logo below) in a rural settings where R/C enthusiasts gather to share the joy of adjusting, fixing, tweaking and flying radio-controlled model airplanes and helicopters. 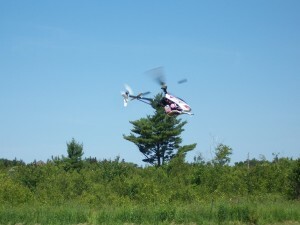 Drop in by the R/C Wings Hobby Supplies store to see their lasted R/C models, both ARF and RTF. For the more adventures, R/C flyers, recent kits are amazing as well. The store is less than half a mile from the Block-House 4-way stop, heading towards Mahone Bay. 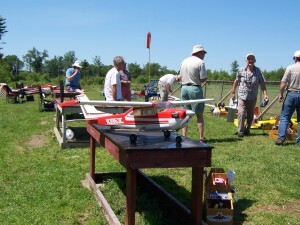 The club is also affiliated with the Model Aircraft Association of Canada (MAAC), a non-profit organization dedicated to fostering and overseeing through promotional events and self-regulation material the orderly and safe development of R/C flying throughout Canada. It also administers a mandatory liability insurance plan for its members in addition to disseminating information on R/C flying safety rules and best practices. 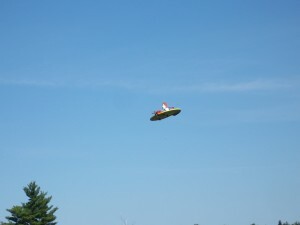 Once every summer, the South Shore R/C Flying Club holds a fun fly event open to the public at the airfield where expert and beginner R/C pilots alike show their latest model aircraft creations and skills. The event is also a social one with many club members bringing their families and friends. 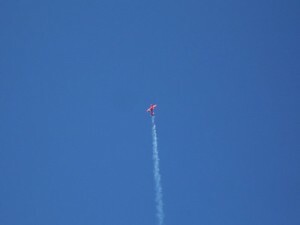 It also attracts participants and visitors from afar which makes it really a regional flying event. 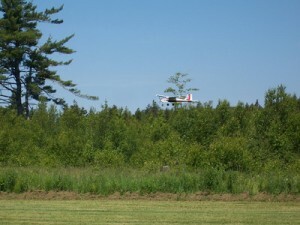 Given the number of participants, it is quite common to be able to watch a number of R/C aircraft doing their song and dance in what seems to be a narrow spot over the airfield, but generally at different altitudes. Sometimes pilots confer amongst themselves before sharing the skies above the airfield, and other times they simply go by implied rules of collision avoidance and courtesy. Some of these model aircraft are not all that easy to fly due mainly to their high response capability (or control sensitivity) and/or lightness, thereby making for some pretty interesting landings to watch, especially when the wind kicks up turbulence on final approach. Dead-stick (engine out) landings do happen at such fun flys and, depending on where the public’s attention is focused on, these landings will generate a fair amount of interest from onlookers with the occasional applause when the powerless R/C airplane makes a safe, graceful and strangely quiet glide back to the grass strip. For some pilots, engine-out landings seem like routine; in the case of others with less experience, one can feel tension in the air as the stricken airplane limps back to the field with barely enough altitude to spare. The more expensive the R/C airplane, the greater the concern for the aircraft’s owner and the sense of relief when all ends well. High-performance stunt planes have a high power-to-weight ratio and can perform manoeuvers conventional aerobatic airplane pilots can only dream of. Same with some advanced R/C helicopters. Public and non-public zones are clearly marked in conformity with MAAC rules, the cosy club-house is spiffied up for good looks, lawn chairs are spread around and last but not least, a mouth-watering canteen service is set up by club volunteers. Money made from the canteen goes back into the club’s piggy-bank for the general upkeep of the club’s facilities and other sundry expenses. 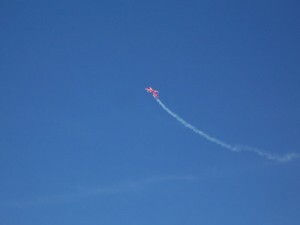 This year’s event was held in perfect flying conditions under blue skies and mostly manageable winds. 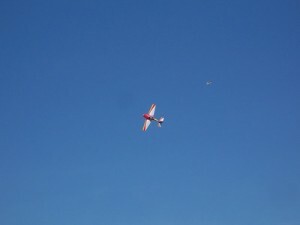 As in the past, there were some spectacular aerobatics, R/C model aircraft of all sizes, shapes and colours. In recent years, electric-powered R/C models are making inroads into this kind of fun fly, as the market for these quieter units is rapidly increasing. Photos below are so recent, they are all I can post at this stage. Comments on the annual Fun-Fly will evolve with time. There is so much to observe, more than meets the eye. 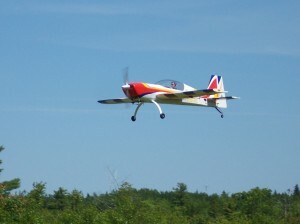 Rotary Wings R/C aircraft: These are delicate yet fascinating machines. There are more moving parts to adjust and balance on advanced models than you can shake a stick at. 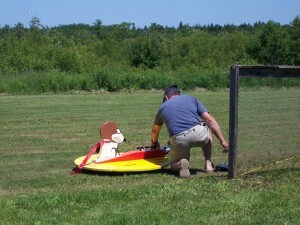 The skills required to fly these advanced models take more time to develop and hone than in the case of r/c airplanes. c) Gyro- assisted stability, etc. Initial hover is usually performed in ground effect for two reasons: 1) helicopters are less stable in ground effect and this provides a better opportunity to test gyro-assisted stability and the pilot’s proficiency with the machine before transitioning to in-flight movement. From stable hover to foward tilt to gain speed. Here comes Snoopy the flyer. Gain forward speed and some height. Throttle back some, relax and enjoy flying around or…Go into full aerobatics, r/c helicopter model permitting. Good landing, Snoopy! What’s that funny grin on your face? Too many flies in your teeth on the way down? Great weather. 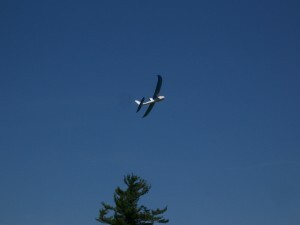 Wind a little challenging above tree-level for beginner pilots and slow-flyer aircraft. 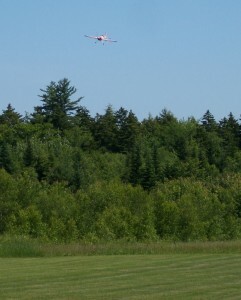 At ground level, R/C models were landing and taking off both into or with the lower light winds. Goes to show the difference in wind within a 50′ height difference. The craftsmanship and flying skills were astounding! Scale-like Cessna 182, most likely ARF out of the box. Closer yet. What is he up to?